Does the spring season have you yearning for a change – itching to buy a new house or to redesign current home? Maybe you’re just looking for some small punches that will make a big splash on your home’s style? As we usher in spring which is traditionally a very busy season for home sales, it’s a perfect time to reveal the spring home design trends for 2014. In January, I updated you on the Top Home Design and Remodeling Trends for 2014 and now here is part 2. 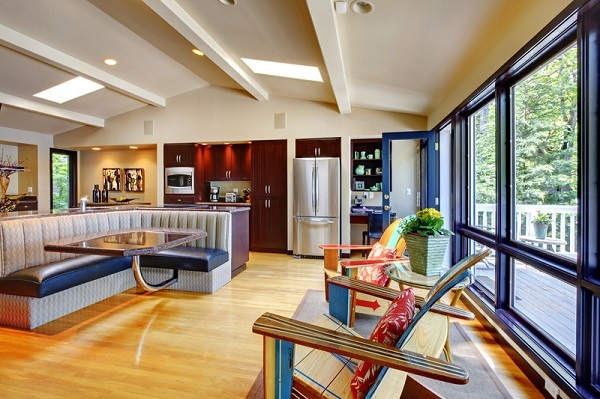 Below check out the top three hottest spring 2014 home design trends. Mother Nature has moved indoors this season. I forecasted some of this in my January article where I quoted Michael Booth, Interior Designer at BAMO, as saying, ‘In 2014, we’ll see warm woods, serene blues and refined textures integrated into private spaces designed to restore body and soul’, and it looks like the elements are here to stay through 2015. Whether incorporating greenery, wood, minerals or rock into the home design – nature is hot, hot, hot this season. Mother Nature is inspiring design in a big way this year and homeowners are finding unique ways to incorporate rocks, minerals and other natural elements into their home’s design. Repurposing antique furniture into hidden storage solutions is a popular trend among interior designers and homeowners alike. An old trunk can double as the perfect coffee table. …be selective [with antiques] and use beautiful pieces of furniture for an instant design statement. Color is still the hot topic as we move into spring. In an article titled From floor to fixtures: Top spring home decor trends add style and personality in the Seaside Courier, Vickie Gilstrap, director of design services for The Dixie Group, a top U.S. carpet manufacturer, says design color schemes are warming up. Colors are getting warmer. Taupe is the bridge color taking us from gray to browner tones. Warm pinks are returning, as well as warmer greens like moss and olive – even apple. As I mentioned in the January piece, color was the big news in home design as we started 2014. At the start of the year however, there was a move toward a more serene, clean color palette of cool blues and neutrals. But as we head toward 2015, nature themed colors are in – all kinds of warm greens are the hot spring colors! The trend of nature and color has also spilled over into the kitchen. Elle Décor in their article titled Big in 2014: The Trends that Will Define the Year Ahead reports that “custom cabinetry painted in rich gemstone colors, and accented with gleaming brass or chrome, all lit by unusual lighting fixtures.” Also hot are ‘surfaces that mimic malachite, agate, and other exotic semi-precious stones’. Do you agree with trends – are you going to rush out and redo your living room or kitchen? It might be fun, but the best part about home design trends is that while they are a great guide to stay in line with what is hot and selling right now, as a home owner, you don’t have to agree – it’s your sacred space! For more information on the hottest spring home design trends for 2014 or to schedule an appointment to view home listings or sell a home in Westlake Village or the surrounding neighborhoods, contact Lydia Gable today for a consultation.